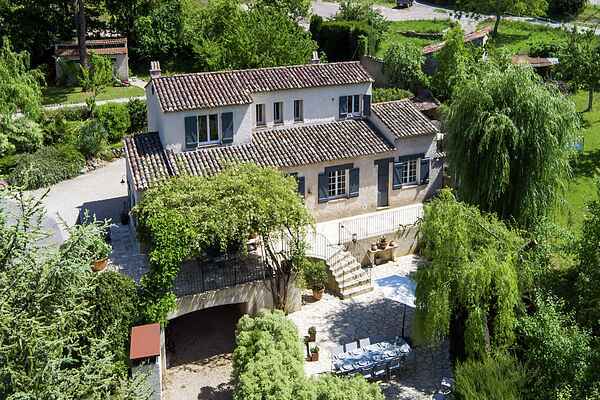 This luxurious villa in the Provençal style is located within walking distance from the picturesque village of Saint-Paul-en-Forêt. The very spacious residence is furnished in a stylish modern design. The villa is surrounded by a well-maintained garden with lots of trees, which provide the necessary shade. From the villa you can step directly onto the delightful covered terrace, where the whole family can eat and drink together. There is a view of the swimming pool (salt water) from the terrace. The pool is surrounded by a terrace with luxurious sun loungers. The villa is in a lovely location in the midst of the beautiful forested area round Saint-Paul-en-Forêt. You will find the beauty and tranquillity of Provence here. Fayence, Seillans, Callian, Tourrettes and Montauroux are marvellous little Provençal villages nestled against the mountainsides like eagles' nests. You can ramble the winding lanes of these villages, greeted by the typical Provençal aromas of thyme, lavender and rosemary. There is also a large lake nearby (The Lac de Saint-Cassien). The Mediterranean is 35 km away, with the coastal towns of Fréjus and Cannes. You can also take daytrips to Monaco, Antibes, Cannes and Grasse. Only three minutes walk up into the village and the \"Boulangerie\", where you may buy fresh croissants or other fresh products from the Bakery. There are plenty of pitoresque hiking paths for biking or walking in this area. Recommended!